Ralph Breaks the Internet held onto its high score and retained the #1 spot at the domestic box office for the second weekend in a row. The film took in another $25.8 million domestically and added another $33.7 million internationally. Domestically the sequel has brought in $119.3 million with an international total of $87.7 million, giving it a global haul of $207 million. 2012’s Wreck-It Ralph ended its domestic run with $189.4 million, putting the sequel in prime position to match or exceed the first film’s total. Featuring the voices of John C. Reilly and Sarah Silverman, the sequel is directed by Rich Moore and Phil Johnston. Universal Pictures new animated version of Dr. Seuss’ The Grinch jumped back up from third to second place, with another $17.7 million. The animated feature now sits at $203.51 million domestically. Internationally the film has brought in $64.8 million for a Global total of $268.31 million. Benedict Cumberbatch lends his voice as the title character of the animated film, it’s directed by Scott Mosier and Yarrow Cheney. Creed II switched places with The Grinch for a third place spot in its second weekend. The sequel added $16.8 million to its domestic total which now stands at $81.1 million. In that same time frame, the first Creed had brought in $64.58 million, all but assuring us that Adonis Creed will fight again in a few years. Steven Caple Jr. directed the sequel which once again stars Michael B. Jordan, Sylvester Stallone, and Tessa Thompson, plus Florian “The Big Nasty” Munteanu as Viktor Drago and Dolph Lundgren returning to the role of Ivan Drago. Warner Bros.’ Fantastic Beasts: The Crimes of Grindelwald, the 10th feature film in the Wizarding World, held onto the fourth place position adding another $11.2 million domestically for a total of $134.34 million in the US. Internationally the sequel took in another $40.2 million in overseas box office this weekend. Internationally the film has brought in $385.3 million, and the global tally is $519.6 million. The film is well behind 2016’s Fantastic Beasts and Where To Find Them which brought in $234 million domestically and $814 million worldwide. Directed once again by David Yates and from a script by JK Rowling, the film stars Eddie Redmayne as Newt Scamandar alongside returning stars Katherine Waterston, Dan Fogler, Alison Sudol, and Ezra Miller. They’re joined by Claudia Kim, Zoe Kravitz, Callum Turner, with Jude Law as Dumbledore and Johnny Depp as the titular Grindelwald. 20th Century Fox’s Bohemian Rhapsody brought in $8.1 million for a domestic total of $164 million. The film’s international haul now sits at $328 million, giving it a global total of $493 million. Directed by Bryan Singer the film stars Rami Malek, Gwilym Lee, Ben Hardy, and Joseph Mazzello. Also starring are Lucy Boynton, Aiden Gillen, Tom Hollander and Mike Myers. Paramount Pictures’ Instant Family brought in $7.15 million giving the family comedy a domestic total of $45.92 million. Mark Wahlberg stars alongside Rose Byrne in the film with Octavia Spencer, Tig Notaro, Isabela Moner and Iliza Shlesinger. Sony’s The Possession of Hannah Grace, which has been delayed for a few years, brought in $6.5 million for a seventh place debut. The horror film brought in $4.1 million internationally for a worldwide total of $10.6 million. Given the feature had a $9.5 million budget it’s on its way to recovering budget and ad costs for the studio. Directed by Diederik Van Rooijen the film stars Shay Mitchell. 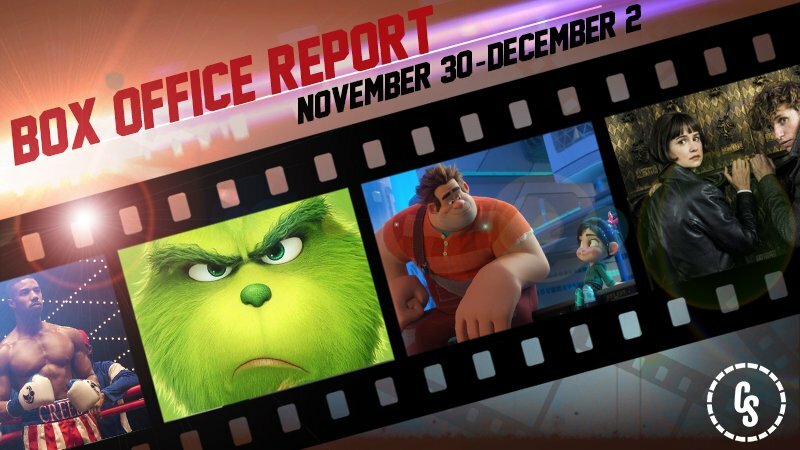 The post Ralph Breaks the Internet Holds the High Score at the Box Office appeared first on ComingSoon.net.